It's the future. Check out this stair climbing wheelchair developed by a team of engineering students in Switzerland. Today GoodTemps celebrates its 20th Anniversary. For over 100 years Goodwill Industries has helped individuals with disabilities, as well as those with other barriers to employment find work. On December 17th-18th, GoodTemps will be moving to a new office space. Happy 19th Birthday to GoodTemps! We want to thank everyone who has supported us throughout the years. Special thanks to our amazing team for their hard work and efforts. Stay tuned, many more exciting jobs and years to come! Happy Thanksgiving from the GoodTemps team! Sending special thanks to our temps, customers &amp;amp; contacts. GoodTemps offices will be closing early on 8/29/2014 and closed all day on 9/1/2014 for the Labor Day holiday. Top candidate placed in less than 2hrs after interview this morning. Director of Business Development, James Carlson @ the Sage Works Career Day on 6/17/2014. Find your next star employee in Jehanne, Edna, and Shirley. Jim Wolf, a US Army Veteran from Michigan, has been homeless for decades, and frequently struggled with alcoholism. In this latest Top Candidates feature, we're bringing you three fantastic jobseekers with a combined thirty eight years of work experience in the executive administration and pharmaceutical fields. 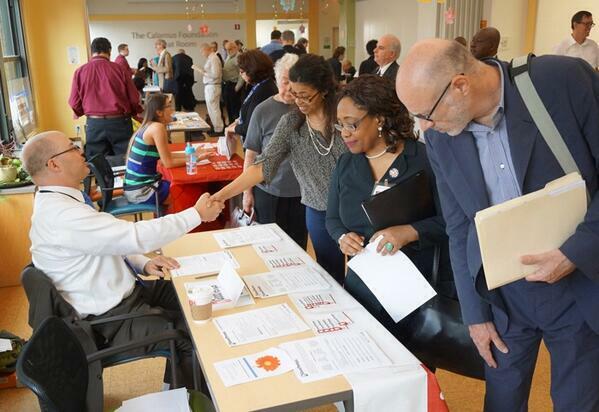 An album of photos from the Post Sandy Job Fair for Greater New York that took place on May 14th has just been posted on their Facebook page. The event was a great success, with a huge turnout of enthusiastic job-seekers and employers, and some great career workshops. Head over to the PSJF Facebook page for the photos. Meet Delloise, Babatunde and Ji Hyun! Each day, GoodTemps provides scores of companies throughout New York and New Jersey with the staff that keeps their businesses running smoothly. Learn how one of these top candidates can make all the difference.